How to Create a Samba School Logo? Creating a logo for your samba school is a possibility to get an image that will serve not only as a symbol of your institution, but also as material for promotional items, accessories and ad videos. The sure option for such logos is an image of a dancing man or a bird with wide ornate wings. Any combination of abstract elements will look good too. The colors should be deep, golden yellow and red color scheme is the most often used. The font can be bold or italicized, creating an impression that the letters themselves are dancing and making the image more dynamic and extraordinary. One more popular option is to write the name of the school in perspective, i.e. the farther the symbols are located, the smaller they seem. 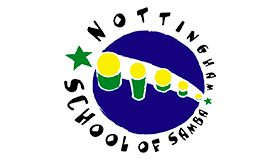 Ideal examples of images of this type are logos of famous dance schools such as Samba Real, Nottingham School of Samba and PARAISO. They attract attention with their brightness and stay in memory for a long time. How do I create a samba school logo for my brand?